Did Obama really brand David Cameron “a lightweight”? Today’s New Statesman contain an article (not yet online) in which it is suggested that after meeting David Cameron in London in July, the now President-elect described the Tory leader as "a lightweight". made its way quietly round the upper echelons of Whitehall." If this is true, I find it astounding that it has taken nearly six months to reach the public domain. Furthermore, the video footage of the two men at that meeting suggested to me that the pair were not only very comfortable in each other’s company (unlike the Brown/Obama encounter) but, dare I say it, that they could do business in the (now highly likely) event of them both leading their respective countries in the not too distant future. Do you think the New Statesman account rings true? 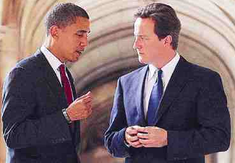 74 comments for: Did Obama really brand David Cameron “a lightweight”?